Mercedes made a pretty bold stylistic pronouncement at the Shanghai Auto Show, where it presented a new concept car: a sleek, compact sedan it calls, imaginatively, ‘Concept A Sedan.’ The car is nicely proportioned and attractive, but to Diamler AG Chief Design Officer Gorden Wagener it seems to represent a larger movement. “Our Concept A Sedan shows that the time of creases is over,” declares Gorden Wagener, and in my imagination at this point he takes a model of a 2017 Lexus GS and smashes it with a baseball bat. 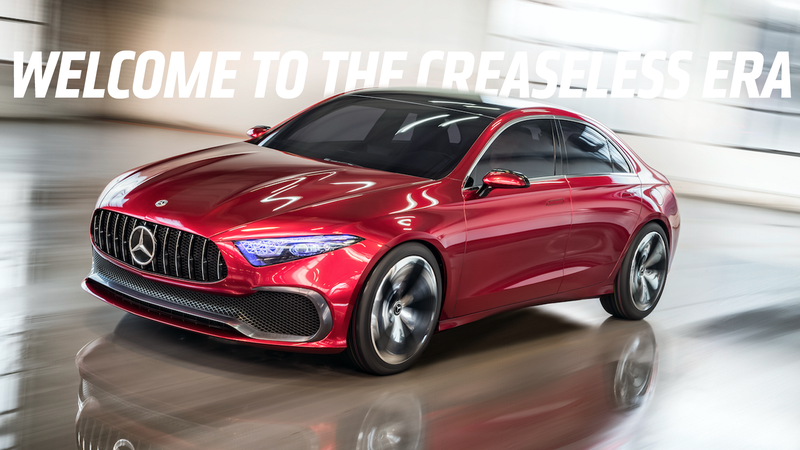 For one I’m blown away Mercedes unveiled a sedan—an honest-to-god, three box sedan—in this age when every new car and concept seems to be a crossover SUV. It’s a breath of fresh air. And it goes even further to make war on creases. The phrase ‘Sensual Purity’ kind of creeps me out, if I’m honest. It reminds me of those unsettling father-daughter ring ceremonies that certain religious families do that feel like creepy weddings or something. Still, I’m pretty sure that’s not what they’re trying for here, and overwrought PR-talk aside, this is a good-looking car. The front-end treatment uses a grille design Mercedes calls the ‘Panamericana’ grille, and the lower, full-width dogbone air intake is reminiscent of what we’ve seen on the X-Class pickup truck. I admit I am a little confused about the “time of creases is over” business, because if creases are over, what exactly are these surface details, then? Pleats? That shot also gives you a nice look at the very detailed headlamp treatment. While this sort of faceting feels a bit like just a show-car indulgence, lighting design has been getting dramatically more ornate, so I wouldn’t rule out seeing something like this on a production car. The unique headlamps are a unique feature of the brand and the striking grid structure on the inside of the headlamp guarantees a confident, easy-to-recognize look. The structural sculpture that has been broken down in detail represents a technically based counterpole to the sensual exterior – “stimulating contrast” is one of the six guiding principles of Mercedes-Benz design. The grid structure in the lamps has been coated with a UV paint and it is exposed to ultraviolet light. As a result, the headlamps “glow” in different colors, depending on the light medium – the daytime running lamps, for instance, are white. That is a nice technically based counterpole, that’s for sure. There’s other interesting details, like the very Tesla-like door handles that sit flush with the body and the lean, twin struts that form a loop to support the side mirrors. Overall, the strength of this concept lies in the very satisfying proportions. It feels similar, proportionally, to other well-designed small cars from companies like Alfa Romeo, or even some of Mercedes’ own ‘60s-era prototypes. They’ve got a nice long hood-short deck setup, and they’ve resisted the urge to cut the greenhouse height down to absurd levels. They’re proportions that you don’t really see all that often anymore; in some ways, it reminds me a bit of what I liked about BMW’s first-gen 1 Series. My guess is this thing previews the next Mercedes CLA. If the automaker can manage to build one that looks like this—which they should, as this looks fairly production-ready—I think they’d have a winner.